We've discussed the Target 20 mechanic a few times (such as in the "Best Combat Algorithm" discussion, a top-10 post for this blog, per sidebar), in which we replace all the standard D&D combat tables with a mechanic of roll d20 + level + modifiers, and check for a total of 20 or more. This simple, time- and space-saving rule has always been the core mechanic in the OED House Rules; I first jotted it down in my AD&D DMG some time in the 90's; and it frequently winds up bleeding into other people's games after they play with me a few times. I recently created a new explanatory page at the OEDGames website. A question that the more discriminating gamers are right to ask is: How accurate is it, as compared to the classic D&D rules (of any edition)? There's definitely a smoothing-out effect, such that it's not 100% exactly the same as the combat tables used in those early editions (in some sense, that's the point; to get away from those slow and clunky table-lookups; however, see later comments by Gygax & Lakofka further below). Let's compute to answer that question precisely. Attack rolls in Target 20 are, at 1st level, exactly equal to the OD&D-B/X combat tables; at middle levels they are very close; and they deviate more at the higher levels, with Target 20 being more generous by a few points. The Target 20 fighter attacks are even closer to AD&D, on average, because the AD&D table was explicitly set up to give a regular 5% boost for every added fighter level (see "Special Note" at bottom of DMG p. 74). Saving throws vs. spells (for brevity, the only one shown here; others are similar) likewise tends to vary from the book results by about 2 points on average. In this case, looking at the details, you'll see that Target 20 is a bit more harsh at 1st level; closely matches the book at middle levels; and is again more generous at the highest levels. Thief skills, looking at the grey-highlighted part of the chart, appear to be more at odds with the book rules; however, this is only the base rule, and in practice we apply the thief's Dexterity modifier to their rolls, presumably a 1- or 2-point shift closer to the book. Given that, the Target 20 results are again exactly the same as the OD&D-B/X rules at 1st level, and then track a little bit below the book rule at higher levels. (Note that in this particular case we used a Normalized root-mean-square deviation (NRMSD) statistic, because we changed the scale from percentile 1-100 to a die roll of 1-20.) My overall interpretation: At the most commonly played levels, Target 20 is maximally accurate to the book; at the more exotic higher levels, it deviates a bit. It bears mentioning that, in later years, Gygax and Lakofka themselves signed off on a smoothed-out progression system (see Dragon #80, "New charts, using the '5% principle'"); although for some reason they were sufficiently locked into their wargame-tablature legacy that they presented this via even larger, mammoth-sized tables. If the system were essentially nonlinear, that could be a time-saving trick -- but since the D&D combat system is indeed fundamentally linear, there's really no need for those tables. 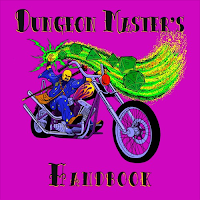 It further bears noting that in practice, when a PC attacks a monster, we (as DM) keep the AC secret -- so players just report the d20 + attack bonus modifiers (a single addition), and the DM mentally adds the monster AC in their head. (Of course, if the player-announced total is itself 20 or more, then they've almost surely scored a hit.) On the other hand, in the case of mass monster attacks or saving throws, the DM may perform a mental reverse-subtraction to come up with the raw die-roll needed, and then roll a fistful of d20's in the open, so that players can immediately confirm if they've been hit or not. But that reverse-subtraction (as is customary with the THACO technique) is never something we ever ask the players to do. Final thought: If you like the Target 20 method (and we hope you do! ), the image at the top here is actually the official Target 20 Compatibility Mark, and you should feel free to use in a new gaming product of your authorship (also, a link to the explanatory web page could be helpful; questions via the email there are welcome). Above all, we hope it's a simplification that helps make your game more fast-paced and furious. Fight on! "Arena" is a Java code package I've developed over the years to simulate combat in Original D&D and generate statistics on the results. We've used it to look at level-based demographics, assess monster metrics, generate bands of men in the wilderness, and lots more. 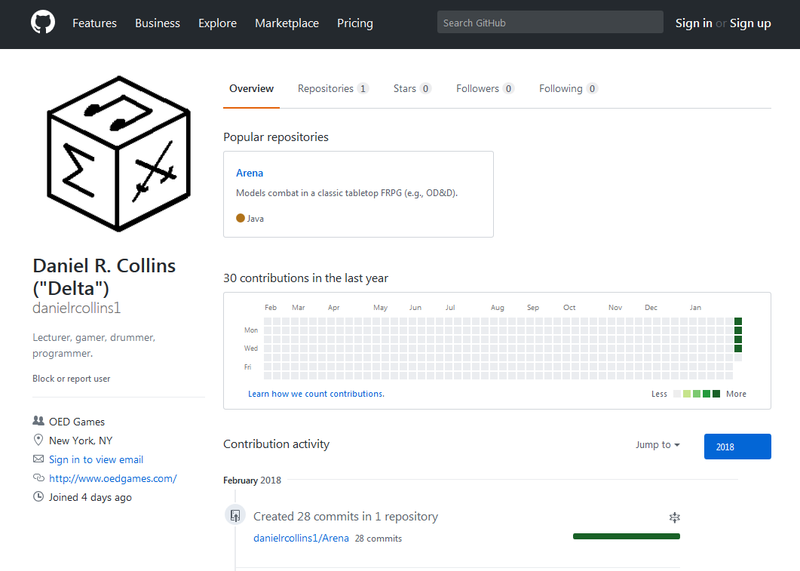 Recently I placed all that code in a GitHub Repository, so if you're a coder, hopefully this a more convenient way to access, inspect, verify, download, run, and fork that package if you have any inclination. Features added in the past few months that are new there: (1) Treasure generation by random methods (for both dungeons and wilderness: see DungeonTreasureTable and MonsterTreasureTable), whereas previously treasure XP was added based on pre-calculated averages. (2) Party-based combat in the Arena, so we can simulate groups of adventurers in a dungeon together (in Arena, see command switch -z), whereas previously it was solo encounters only. (3) Encounter table generation in the dungeon, based on Equivalent Hit Dice values (see EHDToTables). In future posts we'll look at some observations gleaned from these added features. Also recently I put the up-to-date version of the OED Monster Database, used in conjunction with that software, up on the OED Games website. 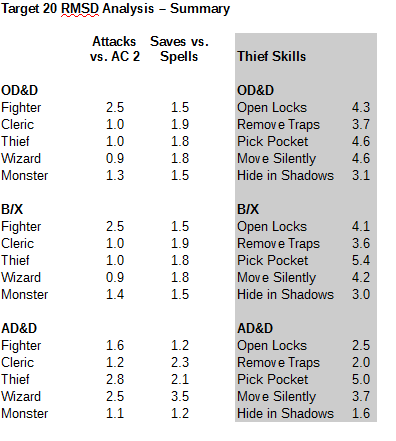 Recent modifications are changes to Equivalent Hit Dice (EHD) values for about a half-dozen monsters (as a result of new data from the software), and an addition of an "Env" column, which is 1 if the monster appears in the dungeon environment (used for the automatic encounter table generation). Again, hopefully the website is a convenient location at which to access that resource. At the start of the week we revisited the (to some) infamous dueling articles in The Dragon #88 by Parker and Winter: principally, should damage from falling be proportional (a linear function) to speed (and thus the square root of height), or instead to kinetic energy (and thus to height itself)? The physics theory seems clear: work is a linear function of energy, not speed. But we would not be scientists if we never put such things to the test. The experiment here is inspired by a teacher's guide for high school students: see Jones, "Understanding Car Crashes: It's Basic Physics", Insurance Institute for Highway Safety (2000). 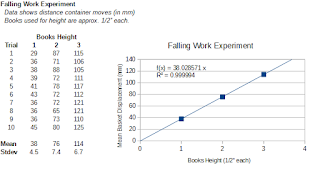 The goal of that experiment, "Lesson 2: Momentum Bashing" (p. 5-10) was to verify that momentum is a linear function of mass; here we modify it to check on the relation between fall height (or maybe speed) and work done. The basic setup is to have some kind of track, one end raised on one or more books, with a ball rolling down into a catch-container. Jones' version used a marble, a ruler with a center groove, and a paper cup with a catch-hole cut in one side. I went looking for those things in my house and found I had none of them. So instead I scrounged up: a bouncy superball, a 15" cylindrical mailing tube, and an empty onion dip container with a hole cut out of it. Conveniently, the mailing tube was almost the same diameter as the ball; of course, if you want to try something similar, any replacement materials are fine. 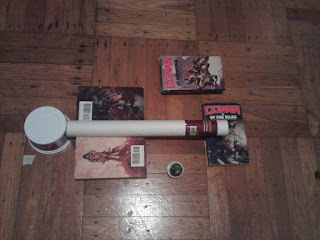 For elevating one end of the track I used my stack of Conan paperback books. Fortunately, the books are all approximately the same width: 1/2" each. So where the track models the gravity of a falling body (angled tracks being a common means for "slowing down" a fall so we can observe it more closely), each added book will smoothly model an additional "floor" of the falling body. I ran the test ten times each with elevation heights of 1, 2, and 3 books. The distance that the catch-container gets pushed forward by the ball at the end is marked and measured with a millimeter ruler, and serves as a proxy for "work done" on the falling body at the end. See picture of apparatus below. 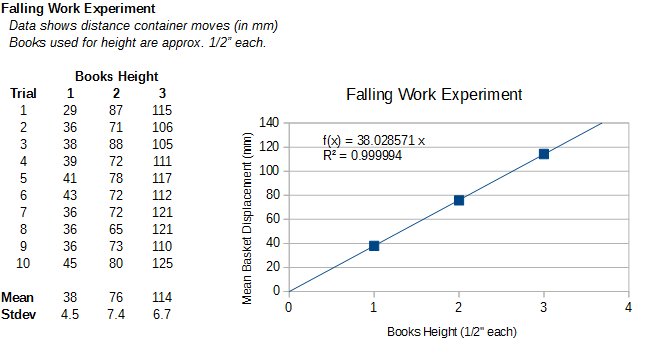 Results of all testing are shown in the chart below, along with a linear regression on mean displacement of the catch-container at each height of fall. For all practical purposes, this proves to be a perfect correlation: the relationship is exactly D = 38h (where D is catch-container displacement in mm, and h height of fall in books), and the 3 data points match a straight line through the origin with R^2 = 99.9994% precision. I wish that any of my high school lab experiments had come out this accurately; I might have gone into a different profession! Our experimental observations exactly match the physics theory; work done by a falling body is proportional to the height of the fall. In the old D&D falling debate, this again confirms Steve Winters' argument that "kinetic energy is the key", and that damage should indeed be a linear function of the fall height (not the speed, i.e., square root of height, as argued by Parker). The Dragon #88 (August 1984) had an infamous set of articles on the physics of falling damage. Some fans of the game maintain that this investigation of math and physics is unnecessary to a fantasy game. However, I’m on the other side of this argument; if there must be some base rule for a mundane activity like falling, then I see no reason not to “dial it in” correctly. Surely there’s no disadvantage to the parties who claim to simply not care one way or the other. Hence, I consider these articles to possibly be the very zenith of D&D system scholarship as it could be practiced. The issue in question appeared in the context of the OD&D and AD&D book rule that falls do a linear 1d6 per 10 feet; and a recent article and update in UA in which Gygax claimed this was a typo, and should have been a far more brutal 1d6 cumulative per 10 feet (e.g., 3d6 at 20’ and so forth). One of the Dragon #88 articles is by A.A. Parker on “Physics and Falling Damage”, arguing that damage should be proportional to velocity, and thus more violent at the start, but scaling down somewhat with greater height (e.g., starts at 3d6+1-5 for a 10’ fall; reaches 20d6 with a 260’ fall). The other article in that issue was by Steve Winter called “Kinetic energy is they key”, whose conclusion is that kinetic energy, and thus damage, is linear with height – thus arriving back at the 1d6/10’ rule we started with. No physical law exists that says kinetic energy is the direct cause of physical injury. We know that there is some relationship between the two – because the more kinetic energy a person transfers to the earth, the greater his injuries are. But no law states that this relationship is linear, or that all the factors involved in kinetic energy relate to the injury. It may be, then, that some part of kinetic energy relates linearly to falling damage. Since no formula exists to tell us what part this might be, we have to use our intuition to determine the crucial property. At best, all of Parker's counters here are equally applicable to his own velocity-based thesis. But worse: there is in fact a physical law which effectively asserts what he claims is missing, and it’s called the “work-energy principle”: per Wikipedia, “the work done by all forces acting on a particle (the work of the resultant force) equals the change in the kinetic energy of the particle”. Assuming a body goes from some initial velocity to a full stop, then the work on the body is exactly equal to the kinetic energy, given by KE = ½ mv^2. (where m is the mass of the body, and v the velocity). So we see that work done is not proportional to velocity as Parker argued; it is proportional to the square of the velocity, and hence directly proportional to energy, as Winter asserted. Consider this from a different perspective: It’s now easy to access data sources such as those used to model pedestrian injuries and fatalities from auto accidents (a fairly good analog to a body hitting solid ground at high speed). See Richards, “Relationship between Speed and Risk of Fatal Injury: Pedestrians and Car Occupants”, Department for Transport, London (2010). Data for pedestrian fatalities, mapped against auto speed, follow a characteristic sigmoid curve. Several proposals for model formulas for probability of death are given; the simplest, by Rosen and Sander is: P = 1/(1 + e^(6.9 – 0.090v)), where v is the automobile’s velocity, and P is the probability of a fatality (p. 14). Below we attempt a linear regression against speed itself (as a test of Parker’s theory), and also speed^2 (proportional to kinetic energy, as a test of Winter’s theory). Taking probability of death as proportional to damage to the body, then it’s rather obvious visually that the better fit belongs to the speed^2, i.e., kinetic energy measurement. The coefficient of discrimination to this fit is R^2 = 0.977, that is, kinetic energy serves to explain 97.7% of the variation in mortality asserted by the model. Combined assumptions of (a) linearity of ΔV_c (i.e., the ΔV preceding restitution) as a function of residual crush and (b) a ΔV_c intercept near 5 MPH, at which no residual damage occurs, have served as the basis for extrapolations outside the range of available test data... The use of linear relationships may be viewed as a simple empirical process for interpolation and extrapolation of the results of staged collisions... it appears that bilinear fits might yield more accurate application results when a large ΔV range is included in the fitted data. Many editions of D&D (starting with the AD&D PHB, p. 105) have a rule capping fall damage at 20d6, and often times this is taken as a simulation of terminal velocity of a falling man (as in the Parker & Winter articles). One problem arises, however: in the core rule this occurs after a 200’ fall, when in reality terminal velocity of a falling person isn’t reached until much later. Compare also to Carl Sargent's revised falling rules in PC2 Top Ballista (1989, p. 61), in which he is clearly looking at real-world speed/distance of falls, and greatly reduces damage to have the 20d6 max occur at real terminal velocity. Terminal velocity for a falling man in a stable, belly-down position is around 120 mph, or about 180 feet/sec (Wikipedia). Due to the asymptotic nature of gravity vs. wind resistance, a person only reaches 50% of this speed after 3 seconds or so (about 140 feet), 90% of terminal at 8 seconds (800 feet), 99% of terminal at 15 seconds (over 1500 feet), and so forth (in a theoretical sense, one never actually reaches the terminal speed; it's only a limit). See the excellent chart by Green Harbor Publications, 2010; to my eye, the “inflection point” in the graph is at around a 6-second, 500-foot fall, at which velocity is about 80% of terminal. In core D&D terms, this would argue for max falling damage of around 50d6 or something like that. Let's compute for more specificity on that point. For simplicity, I define a new energy unit, the footman force, as one man × ft^2/sec^2 (compare to the foot-pound force). As a preliminary, we compute the speed from a 10' fall, assuming that for such a short height, air resistance is negligible: sqrt(10)/4 × 32 = 25 ft/sec. This allows us to compute the kinetic energy from the 10' fall: KE = 1/2 mv^2 = 1/2 (1 man)(25 ft/sec)^2 = 312 footman forces. On the other end of the continuum, where air resistance is total, we are told that terminal falling velocity is about 180 ft/sec; and in this case the kinetic energy is KE = 1/2 (1 man)(180 ft/sec)^2 = 16,200 footman forces. The ratio between these two energy amounts is 16,200/312 = 51.9; that is, very nearly 50 times the energy (and we would argue, damage) between a 10' fall and one at terminal velocity. That said, we ignore this detail at the present time and consider a rule only for approximately man-sized creatures. So: Around 50 feet kills about 50% of human victims. Note that this is actually much more generous than the standard D&D rule, which in its simplest form will kill about half of normal men with just a 10’ fall (1d6 damage vs. 1d6 hit points). It broadly contradicts Gygax’s advice in OD&D Vol-3, p. 6 (“there is no question that a player's character could easily be killed by falling into a pit thirty feet deep”). To say nothing of Gygax’s intuition at the time of UA that such damage should be massively upgraded with a cumulative rule. A save-vs-death at zero hit points; this has been the existing OED house rule for some time (recently edited so that any "overkill" damage becomes a penalty to the save). If you like, consider this to be broadly analogous to permitting negative hit points before death. A save-vs-stone for half damage; this is inspired by the medical findings that there is a binary difference in mortality depending on whether a victim hits their head/chest or not (specifically, almost exactly a 50% change in LD50 mortality). Possibly reducing the damage dice to something like 1d6 per 20 feet. On the one hand, the basic D&D rule is unrealistically harsh: 1st level characters (and normal men) have 100% mortality from a 50' fall. Even if we engage any one of our cushioning rules, then it is 3rd-level characters who have around a 50% mortality rate (as shown in the first chart). But on the other hand, if we do calibrate the system so that 1st-level characters have a 50% mortality rate (as in the real world), then that requires engaging all of our proposed edits -- reduced base damage, a save for half, and a save vs. death at zero hit points (as shown in the second chart). And then as a result, any higher-level characters have effectively negligible chances of perishing from a fall of that height (further down the same column). Let's take a case study from the pulp literature: in the short story "The Scarlet Citadel", Howard relates a scene in which Conan grapples the sinister and powerful Prince Arpello and hurls him from a 150' high tower, upon which, "the body came hurtling down, to smash on the marble pave, spattering blood and brains, and lie crushed in its splintered armor, like a mangled beetle" (Ch. 4). If we assume this worthy is a 9th-level Lord (he's described as a capable fighter, a veteran of many campaigns), then we can re-run the simulation at this greater height. If we use the latter fully-cushioned rule proposal, then mortality from this fall would only be 2% -- clearly unacceptable. 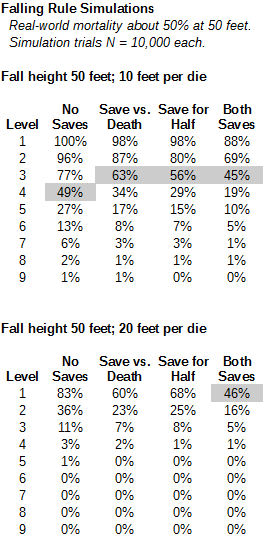 If we keep the 1d6/10' rule but allow the two saves, chance of death would be 35%; with just the half-damage save 43% (I think both of those are still too soft); with just the existing OED save-vs-death mortality is 72%, which feels about right (no saves at all would give 85% mortality). In summary: Calibrating the rule so that normal men have a real-world LD50 at 50' requires a rule so generous that it completely violates our intuition and literary examples for higher-level characters falling from truly stupendous heights. The best we can do is massage something acceptable in the middle. And it turns out that the classic 1d6/10' damage, with a single save of some sort (like: OED save-vs-death, or some negative hit point allowance) does give a vaguely reasonable result around 3rd level or so. Considering that this effectively requires no modification to our existing ruleset, it seems like living with this is among the best options. It also seems like a recurrent theme that many parts of the D&D system are most "realistically calibrated" for characters of around 3rd level; perhaps this gives extra support for starting campaigns at around that level (as Gygax did in later years; see ENWorld Q&A thread, date 11/19/04). See also: Environmental Rule of Three. I'm comfortable with existing OED save-vs-death at zero hit point representing the variation in whether the victim lands on their head/chest or not. 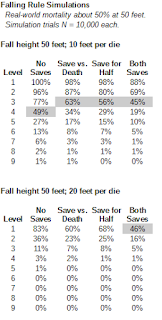 And I think I'm now compelled to bump up the maximum fall damage to 50d6 to reflect true terminal velocity (which neatly takes care of the need for extra saves-vs-massive damage or the like, since everyone up to a lesser god gets equally pancaked from arbitrarily high falls). Open question: In pulp heroic literature what other examples of survivable falls do we see for figures like Conan, Fafhrd, Elric, etc.? Perhaps we could use that to “dial in” the rule better, if necessary. 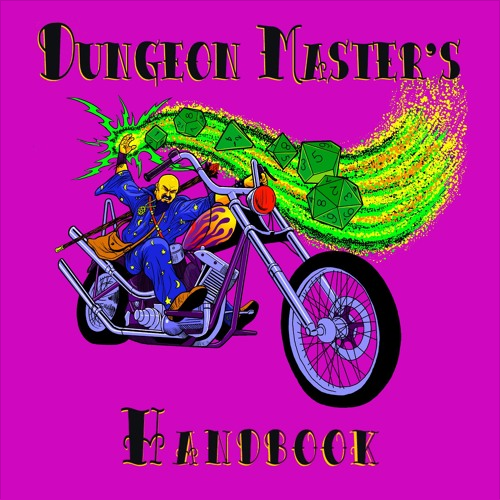 Friend of the blog, Michael "chgowiz" Shorten has a regular podcast called "Dungeon Master's Handbook". In his most recent episode he shares a really nice overview of the history of trying to incorporate mass-warfare rules into D&D games: including Chainmail, Swords & Spells, Battlesystem, War Machine, and so forth. Just like me, he spent years struggling with them and finding all of them deficient in some way to what we really wanted (the primary weakness to TSR offerings being: rules that are simply out-of-sync with D&D mechanics and results, and likely too abstract and complex to boot). He uses the name "Holy Grail" for the problem of finding a system which is: (1) mechanically compatible with D&D, (2) easy to interface D&D monsters and characters into mass battle, (3) simple enough to easily introduce to RPG'ers who are not expert wargamers, and (4) fun to play. And he concludes by calling our product, Original Edition Delta: Book of War (see sidebar) the best solution to that problem, using such complimentary words as, "an amazing solution", "worked wonderfully", and "it's all there". Of course, it's exactly these same motivations that had me tinkering for a couple decades or so to find the right, streamlined system -- so I couldn't be more honored to know that it works as a solution to other thoughtful gamers out there. Chgowiz has consistently given great feedback on the game by email and blog comments here, too. He authored the supplement called "The Fellowship" which allows lower-level PCs to function on the battlefield as joint party-based figure -- he talks about his experiences with that in the podcast, and we wrote about it earlier here. All of his output is highly recommended. If you're not aware of the legacy of mass-combat rules orbiting around D&D, this is a great place to start!